An interesting list and logically based taxonomy in need of empirical validation. 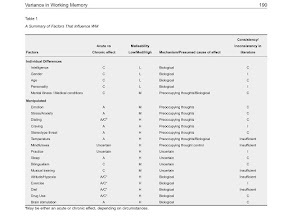 In this paper, we systematically reviewed twenty-one factors that have been shown to either vary with or influence performance on working memory (WM) tasks. 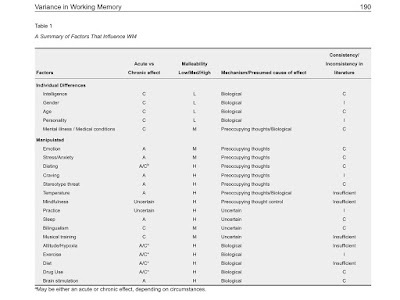 Specifically, we review previous work on the influence of intelligence, gender, age, personality, mental illnesses/ medical conditions, dieting, craving, stress/anxiety, emotion/motivation, stereotype threat, temperature, mindfulness training, practice, bilingualism, musical training, altitude/hypoxia, sleep, exercise, diet, psychoactive substances, and brain stimulation on WM performance. In addition to a review of the literature, we suggest several frameworks for classifying these factors, identify shared mechanisms between several variables, and suggest areas requiring further investigation. This review critically examines the breadth of research investigating WM while synthesizing the results across related subfields in psychology.